Vicinity RFID Solutions Pvt. Ltd. Initially code named V-RIF, the middleware software was branded as Vicinity AgileRFID since July 2008 and has since been implemented across varied domains including Warehouse/inventory tracking, Dispatch management, Asset tracking, Customer Identification, Document Tracking, Vehicle Access management, Asset reconciliation, Jewelry tracking etc. 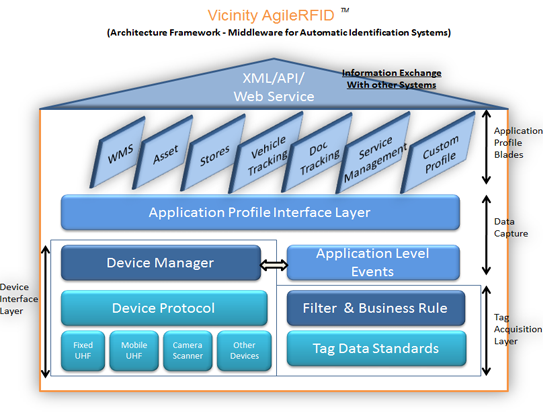 Vicinity AgileRFID is built on a web enabled platform and has multiple layers like Device Interface Layer, Tag Acquisition Layer, Data Capture, ALE, Profile blades and Information exchange layer. The middleware provides real-time interface between RFID systems to back end systems addressing a wide variety of business needs. The back end systems can include ERP, Bank systems, CRM, SCM and Security. Designed by OPEL Systems & Consultants Pvt. Ltd.